Are they here or are they there or are they somewhere in between? Among the most persistent questions in the study of immigration are the extent to which immigrants engage in activities that maintain connections to their native lands and the pace at which their attachment shifts from country of origin to country of destination. These questions are important simply as a descriptive matter to understand the nature of migration, and they have broader implications in the debate over immigrants’ allegiances and loyalties. The answers, however, are neither simple nor straightforward. Maintaining connections with a country of origin is a central component of the Latino immigrant experience. Large proportions of Latinos who have immigrated to the U.S. have regular contact with the relatives and friends they left behind through travel, telephone calls or emails, or by sending material support, or remittances. These connections also have a clear and defined impact on how immigrants think of themselves. For most, the native country is an essential part of their personal identity. And while they are optimistic about their future in the U.S., they also continue to see much that is positive in the countries where they were born. This report is based on an analysis of the 2006 National Survey of Latinos, conducted by the Pew Hispanic Center. Several batteries of questions in the survey were designed to reveal the extent of Latino immigrants’ ties with their home country. 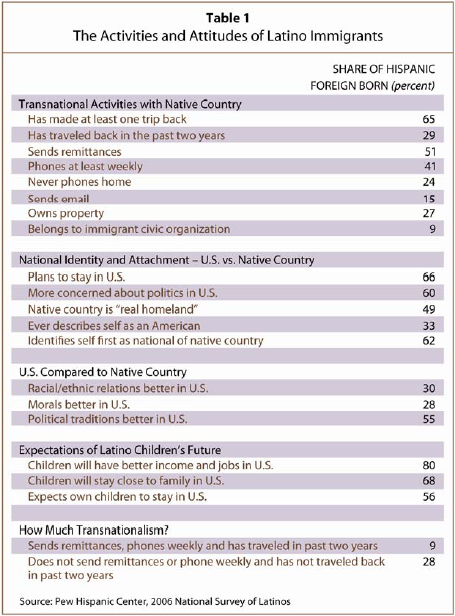 The analysis examines findings on three transnational activities—travel, communications and remittances—and cross-references them with data on several key characteristics such as nationality and length of residence in the U.S. A further analysis explores responses to questions that probe immigrants’ perceptions of their native country and the U.S. as well as matters of ethnic and national identity. Finally, the report examines the relationship between these activities and attitudes, especially among those who maintain the most extensive ties to their native country.